The start of a new term can be a shock with the stress of trying to get everyone out of the house fed, looking presentable with the right kit in such limited time. I have learned from experience that planning and preparation is definitely the key to a calmer morning. Here are my top 5 tips based on some of the things we now do that help us to have a stress-free school-run! Uniforms: get them all washed and ironed at the weekend ready for the week. Put each set on a hanger so the kids can just grab and go. Having one set of uniform for each day is a lifesaver for me because my boys never come home clean. Have a designated place for school shoes, even if it's just a box by the door. I find coat pegs are a good place to keep ties with blazers. School bags: empty them straight after school. Remove newsletters, do any admin straight away, discard rubbish, check for homework etc. Repack and leave by door. Lunchboxes: I fill them with drinks and snacks the night before and just make sandwiches in the mornings. Sometimes there’s a yoghurt explosion to clean up first. Baths & showers: we all have baths & showers before bed now. Saves a humongous amount of time in the mornings and we sleep better too. There’s a reason why airlines tell you to put your oxygen mask on before you help anyone else put theirs on – you might not get the chance! If I get up late and rush around in my PJ’s time flies and I barely have a chance to shove some clothes on before racing out. Being up and ready early makes me feel so much calmer. I often leave some clothes out for myself the night before to save a couple of extra minutes in the morning. This sounds so much more formal than it actually is! By simply doing things in the same order each day everyone gets to know what they should be doing next. For my boys it’s roughly this: get up, get dressed, make beds & fold PJ’s, go downstairs, eat breakfast, tidy plates, brush teeth & hair, coats & shoes on, pick up bags and go! Have a few easy breakfast ideas to hand for the week – it’s even more helpful if everyone eats the same thing on the same mornings. The whole family can enjoy Nutella, spread on wholegrain toast. (It’s absolutely delicious topped with some sliced bananas or other fresh fruit). 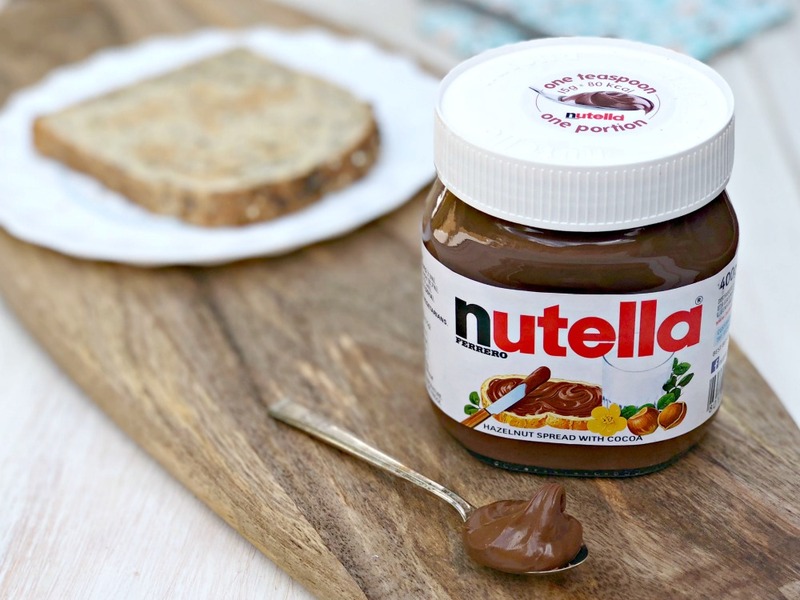 The recommended portion size of Nutella is one heaped teaspoon - that’s just 15g - but a little goes a long way. One portion is only 80 calories, and it’s more than enough to spread on a slice of bread or toast. Nutella is made from only seven quality ingredients so it can be eaten as part of a balanced breakfast. from getting distracted and losing focus. Over to you! What are your top tips for making sure you get out of the house on time? I'd love to hear from you! Please comment below! This is a sponsored post in association with Nutella. All words & images are my own.